You are hooked now; it is not a love for diving anymore, it is an obsession. Reach your next diving goals by going to depths that require more skill and advanced breathing mixtures with the GUE Recreational Diver 3 course. This is a limited decompression course structured to teach advanced diving skills, prepare divers for utilizing decompression cylinders and double tanks, and to breathe helium-based breathing mixtures appropriate for deeper recreational diving to 39 m/130 ft. Recreational Diver 3 is for divers who have completed Recreational Diver 2 or a GUE Fundamentals course at the “recreational” level and have completed at least 75 non-training dives, of which at least 25 must be with double tanks. knowledge of relevant physics and physiology, familiarity with the theory and practice of decompression, correct ascent procedures, the use of decompression cylinder, the use of nitrox for decompression, the use of normoxic Helium (30/30 and 21/35) to minimize narcosis, CO2, gas density, and post-dive “nitrogen stress,” and the basic regulator/manifold failures procedures. Have passed the GUE Recreational Diver 2 course or a GUE Fundamentals course at the “recreational” level. Have completed the GUE Doubles Primer course or be proficient in doubles with at least 25 experience dives. Have a minimum of 75 non-training dives. For a full list of course prerequisites, click here. The Recreational Diver 3 course is normally conducted over five days and includes eight dives and at least 40 hours of instruction, encompassing classroom, land drills, and in-water work. Being a GUE diver very often means being part of the team on a diving project. One of the responsibilities of good project team members is the ability to support logistics and have skills allowing them to prepare breathing mixes for their diving teams. GUE’s Gas Blender course is designed to introduce the essential skills required to prepare diving breathing mixtures with emphasis on preparation of GUE standard gases. 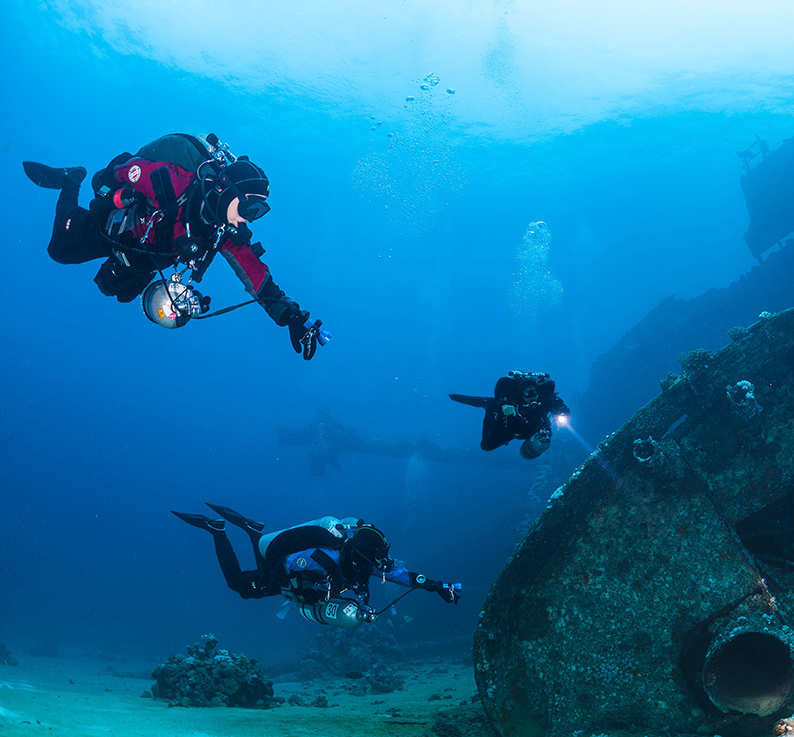 Being a diver means exploring new underwater territories, and with an underwater scooter (Diver Propulsion Vehicle - DPV) the exploration range can expand even further. Riding a scooter is not only fun, but it also allows divers to cover more distance with less effort, even carrying extra gear. GUE’s DPV Level 1 course is designed to introduce divers to the skills and knowledge required to safely use Underwater Propulsion Vehicles (DPV) in open water environments.